In a note to investors on Thursday, Morgan Stanley analyst Katy Huberty, who recently met with Apple management, said the company could debut new internet-based services as well as a "killer app" later this year. In the near term, Huberty said Apple could make a surprise announcement at the upcoming Worldwide Developers Conference in June regarding a new type of internet service such as streaming music or a mobile payment system. She went on to say that Apple Internet Software and Service chief Eddy Cue is believed to be working to improve existing services like iCloud and Maps, but at the same time is planning to launch new initiatives. "We believe Apple could charge either developers or users for some of these services, which could boost Apples annuitized revenue stream and better monetize its large user base," Huberty writes. "For example, Apple could offer a streaming music service using a freemium model." Freemium apps allow users to download and use certain titles for free, with costs recouped through advertisements or in-app purchases. Sometimes these apps offer to remove ads for a certain price. The analyst pointed to the recent hiring of Kevin Lynch, who led subscription-based services and wireless device development at Adobe, as a sign that Cupertino may be on the verge of announcing a new project. Apple is rumored to be working on an Internet radio service, dubbed "iRadio," though disagreements between the company and content owners over royalty rates are supposedly holding up proceedings. A report last week claimed Apple was close to inking a deal with Warner Music and Universal Music Group, but there has yet to be an official announcement regarding such an arrangement. Coming later in the year, Huberty expects major earnings catalysts to be the debut of a next-generation "iPhone 5S" along with a low-cost model, new carrier distribution with Japan's NTT Docomo and China's China Mobile, and a "killer app" akin to Siri for the iPhone 4S. As for the app, the analyst offers the example of mobile payments, an area into which Apple has already dipped a toe with Passbook. Such a new feature, Huberty argues, could help drive iPhone 5S sales in lieu of a design overhaul. In addition, Huberty says Apple is likely to announce a cash return program, noting that the company could roughly double total annual return to $25 billion to $30 billion. This would be accomplished by instituting a dividend yield increase to over 3 percent, up from 2.5 percent, while buybacks would return the remaining cash. A report in March suggested that Apple would return some of its growing $137 billion cash hoard through similar dividends and share buybacks. 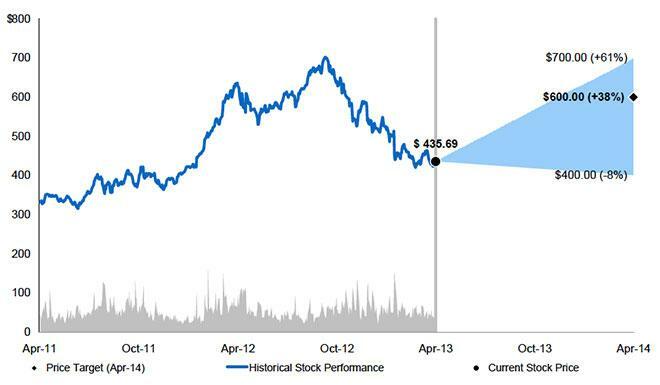 Morgan Stanley maintains an "overweight" rating for AAPL stock with a price target of $600.